"Great room, very helpful staff." Have a question for Puleun House Pension? Puleun House Pension, located in Daepo-hang, Sokcho-si, is a popular choice for travelers. From here, guests can enjoy easy access to all that the lively city has to offer. With its convenient location, the hotel offers easy access to the city's must-see destinations. Puleun House Pension also offers many facilities to enrich your stay in Sokcho-si. This hotel offers numerous on-site facilities to satisfy even the most discerning guest. Hotel accommodations have been carefully appointed to the highest degree of comfort and convenience. In some of the rooms, guests can find internet access – wireless, internet access – wireless (complimentary), non smoking rooms, air conditioning, heating. The hotel's garden are ideal places to relax and unwind after a busy day. Enjoy unparalleled services and a truly prestigious address at the Puleun House Pension. Great room, very helpful staff. difficult for guess to find the hotel. Good stay with friendly Host, room is big and comfortable. need to update their contact number. Hotel service is good. The staff is very helpful. Overall cleanliness is OK but I can still see spider at the corner. I live 2 days here but nobody clean my room in the last day. I went out early and when we came back, I still can see the rubbish in the rubbish bin. But the staff is very helpful, they help us to order fired chicken and call the taxi. Very good service. But the hotel price is a little bit expensive as compare with the room quality. The staff was very nice, friendly, and professional. My two sons, wife, and I enjoyed their hospitality. They made us feel like family. However, for the money, it didn't have an elevator, I stayed on the top usable floor (4th). The were many very large spiders (I killed a tarantula sized spider in the bathroom), and lots of mosquitoes. Sorry, I won't stay again, which too bad, I really, really liked the people who worked there. really good experience; the landlady is really warm-hearted, providing us lots of things. the house is actually not far from the dongbu express bus station, close to the beach, walking distance to one of the seafood market. Also you can take the NO. 7/7-1 bus to Sulrak mount, opposite the SK-oil station, only several miniutes walk from the house. will definitely stay here again. Very enjoyable and quiet and value for money. The people were superb. I really enjoyed my stay here and I can see why other people rated it so highly. The location was very good for checking out the beach. We brought a car, so it was easy for us to drive into the city and to Seoraksan for hiking, but we could just walk down to the shore. This was very nice because in the evening, people were selling fireworks and sparklers and you could just walk down around 8 PM and watch it for free! The main benefit of this pension was the very kind owner. You could really see "her hand" in how nice everything was. When I came to the pension, I had a cold, so she was really concerned that the room wasn't too cold and made sure I was comfortable. She even gave me some homemade tea she had just made that day. Her family was also very kind. There was coffee downstairs in the morning and bottled water you could take freely. In the room, the bed was just as comfortable as my bed at home (I live in Korea) and I slept very well. The room had a small balcony. Everything was available for cooking and we made samgyeopsal. You don't need a pan, pot, knife, etc-- just the food and don't forget salt and cooking oil. The bathroom had nice shampoo, conditioner, body wash, and toothpaste. I felt very at home and comfortable at this pension and would recommend it for a small family, couple, or friends. I almost felt more comfortable here than my own home! A simple hotel, not close to downtown Sokcho, however if you have a car it is fine. Not to far from the beach, however a long distance from central Sokcho, definitely need a car to get around. The home-like setting room is really nice and it provides kitchen and balcony with seaview. Also the staff is really helpful and nice and really make me impressed. didnt know what to expect as there were no prior review, but was pleasantly surprised by the kindness and generosity of the owner. On arrival, we asked if there was any place nearby for food, she immediately offered to cook us ramen. Later in the day when we asked how to get to the dapohang fish market, she gave us a lift in her car instead, and brought us to one of the restaurant and make sure we are ok with the price of the live seafood before leaving. the next day we wanted to get a taxi to the hot spring spa, she again offered to drove us, we declined as she was in the midst of preparing dinner for her family, but insisted to take us there which was a 20mins drive away. overall this is a nice place to stay in, the bus stop to sokcho city, mt seorak, or the dapohang fish markets, are just about 10 mins walk away. and with the price, it is definitely value for money. probably our cheapest and most memorable stay in Korea during our 12 nights. The hotel name should be "Blue House" and not "Blue House Pension". The first taxi driver can't find the hotel and he did try to ask for the local people. Finally, he dropped us in the nearby intercity bus terminal. We asked the staff in the terminal to help. They can't even find this hotel on the internet. Finally, we went to a nearby hotel and the helpful staff helped us to find its location and printed a map for us. With this map, the second taxi driver still took some time to locate the hotel. I think it is better for them to include a telephone no. so that we can call them for help. The hotel is a good hour walk from downtown, bus an easy bus ride . On the bus route to the fabulous Seoraksam National Park. 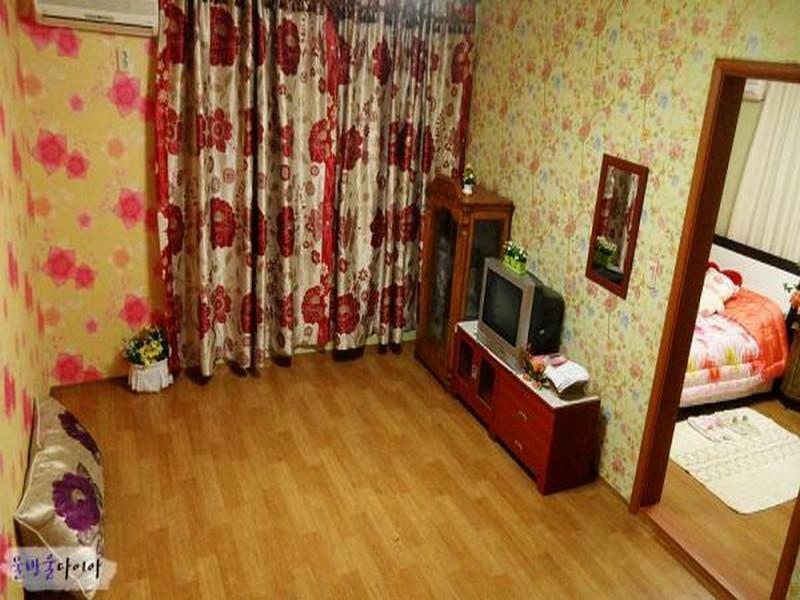 Walking distance to Daepohang Harbour, a charming district with all kinds of good restaurants. Staff english was limited but the lady was very friendly and helpful and always available. Very basic hotel, no breakfast, but clean and comfortable.